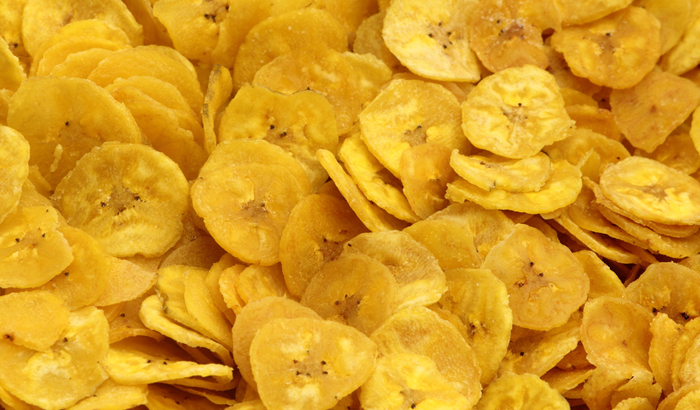 Believe it or not, good banana chips are highly in-demand overseas. So be patient in perfecting your cooking skills—you may be looking at exporting your products soon! These days, healthier snack options are gaining bigger following. That is why banana chips have become among the staples in most pasalubong stalls anywhere in the country. Those could be a little salty or sweet. 1. Peel bananas and put those into a bowl of salted iced water. Add turmeric powder. 2. Slice bananas into bite-size pieces and put those back to the bowl with salted ice water and turmeric. Lay across a cloth for 10 minutes to remove all moisture. 3. Heat up the oil in the fryer until smoke is rising. 4. Fry banana slices in one-layer batches for a minute or two or until crisp. 5. Lift chips out with slotted spoon and lay on paper towels to remove oil. 6. If you want to make the sweetened kind, sprinkle sugar heavily on the cooked bananas and leave overnight in a covered container. 7. Fry again the next day.